This is a post that I started to write in October 2007. I decided to try my hand at painting – it’s been a long, long time. So I pulled out my old sketch book and here’s my first drawing. We all have our insecurities. No? It’s been over 5 years since I told myself I wanted to start drawing again. 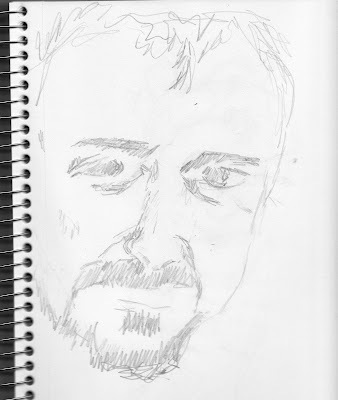 Five years since I rushed out a sketch of Andrew. It’s rough. It’s clear I needed practice and focus. But I drew this and decided I couldn’t do it. And I set down the sketchbook. Thinking about this now, if it was someone else I’d have encouraged some lessons or some practice or whatever to see if he/she could get some enjoyment out of it. But I wasn’t this generous with myself. I’ve recently learned that our county arts center has drop in drawing with live models. It’s inexpensive and unstructured. Pretty low risk, if you ask me. I’d like to be the first to encourage you. You come from a long line of artists. I know you’d enjoy taking some lessons.